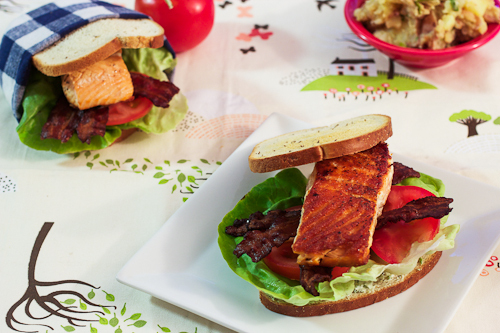 Grilled salmon is great, but a grilled salmon BLT is fantastic. I love these sandwiches on sourdough bread but you could use hamburger buns, too. After grilling your salmon steaks and putting them on the buns, add mayo or a remoulade sauce, fresh basil, tomatoes, and lots and lots of crispy bacon strips. Garnish with snipped chives. Then, go to town. The sandwich is perfect with a dry chilled rosé.